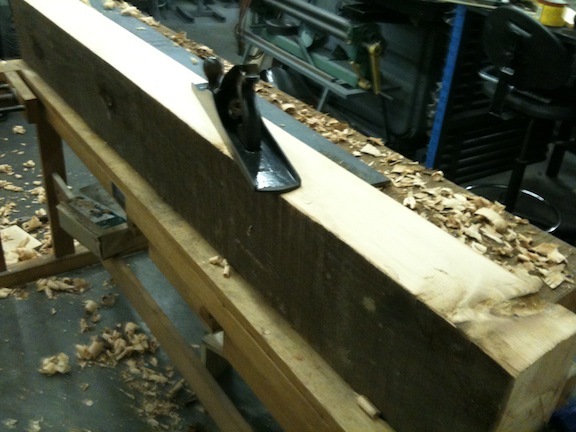 I spent some time this morning working on the the edge of the second beam that will go into my bench top. I had to work the opposite face (against the bench in this picture) enough so it would sit flat and not rock first. You can’t have both the board and the bench wiggling at the same time. I checked this face with my straight edge, and worked the high spot that I found in the middle down with a scrub plane, then worked the entire face. Looking back I should have spent more time in on the high spots with the scrub plane, but it was getting hard to read the surface. I’ve done most of the rest with my #6. I’m checking it with the straight edge, marking it to indicate the high spots, planning them down and checking again. I’m about 1/16″ high in this middle area still. If you look closely you can see my pencil marks. You can also see that there is still rough texture at both ends. I continued on like this, and before I came inside for a break I have the whole surface flat except for about 3″ at one end that is 1/32 low. After I get my breath back I should be able to finish it off. I fully expect to have to do some fine tuning when I fit the two edges together for the glue up. And yes, I’m going to glue it up while the rest of the faces are in the rough. I should end up with a 5.5″ thick top, although it’s going to be narrower than I wanted – maybe 17.5″. Sir Schwarz warns that 18″ wide is marginal as it gets tippy. 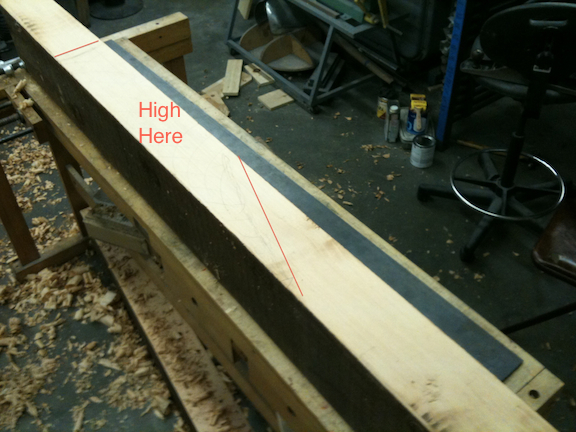 I’ll either add the third beam into the top which will put me around 24″-25″, or I’ll make a trestle base to stabilize it. I already have a tippy bench. OK, I probably need to have my head examined. Again. Or, perhaps, stop reading books and blog posts about workbenches. Or maybe any book by Christopher Schwarz. I’ve been suffering along with my “craigslist special” workbench. It’s an old Sears Craftsman cabinetmaker bench. It’s shaped like a workbench. It has a tail vise with a pair of bench dog holes, a face vise. Dog holes in the top, a place for a tool tray. But the resemblance to a functional workbench stops at, well, resembling a workbench. The tail vise is so loose that it racks if you look at it crooked. The face vise is just as bad. It’s way too light, and held together with 1/4″ machine screws. Seriously. About two minutes of planning and everything loosens up and it gets to wiggling around like a bowl full of jelly. Is that enough for this to count as a seasonal post? 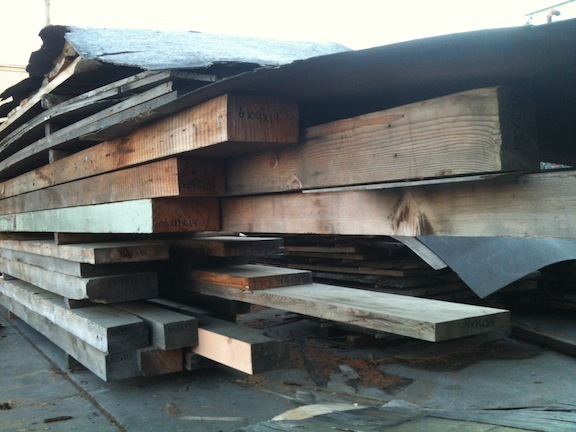 So when I heard about the recycled doug fir on sale at Jackel Enterprises I had to go take a look. 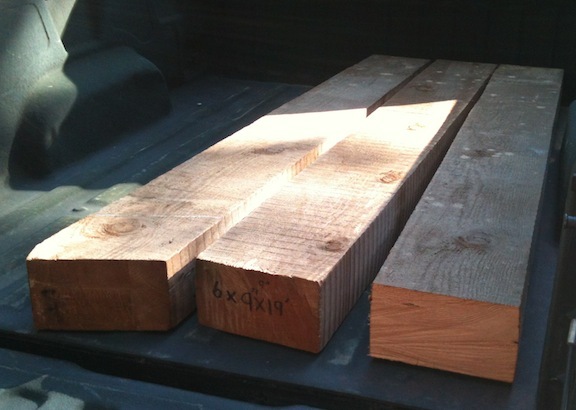 I bought a 6″ x 9″ beam, I had them cut it into 3 pieces with the idea that I’d use two of them to make the top for a mini-roubo bench. The knots are a little worrisome, I probably should have picked through the pile more carefully. Oh Well. I cleaned one face with a wire brush and knocked it down with a scrub plane. The scrub plane really, really doesn’t like the knot on the near end. I chipped out the center of the knot and used a rasp to take down some of the material around it. I’m planning to bring the rest of the face down to meet it. After a bit of work with the scrub plane I started working with a #5 jack, but it kept gumming up. I think I need to move the frog back to open up the throat. For the moment I switched to my #6 which seemed to work a little better. I worked lengthwise and also skewed across the face. 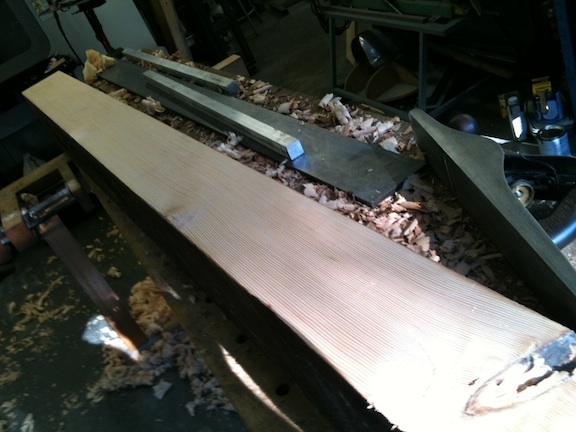 I’m using a 5′ long piece of steel flat bar I had on hand (I have a lot of metal stock) as a straightedge. No, it’s not straight yet, but it’s probably plus or minus 1/16″ at this point. I can tell this is going to be a big learning experience. And an amazing cardio workout. I came in from the shop after 45 minutes of making shavings, sweating and breathing hard. It beats spending time on the Stairmaster, and the smell of the wood as I’m working it is great. Update: Another 45 minutes of work and I’ve got the first face as flat and straight as I can, I checked it for twist with some winding sticks (two lengths of 1″ square aluminum bar stock…lots of metal laying around as I said) and have that taken care of, and checked it with my straightedge. I’m going to re-sharpen my plane iron later and make a final cleanup on this face and call it good.